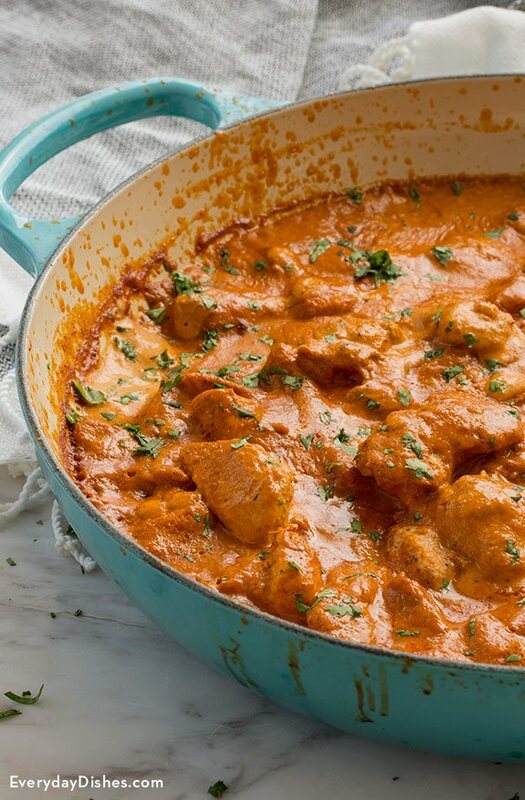 We confess—we absolutely love Indian cuisine and were slightly intimidated about developing a homemade tikka masala with chicken recipe. We had to achieve the taste we were looking for while creating a recipe that is easy to make! Our process ended up being rather straightforward from start to finish—not laborious or intimidating like we initially thought! This dish will make your home smell fantastic and is a complete meal when served over a bed of steamed rice. It’s fun to try new things! To make the marinade, you will need to purchase a bottle of garam masala. It’s been right in front of you all these years in the spice section—some of us just didn’t know what it was used for! This blend of spices, including cardamom, cloves, cinnamon and black pepper is available in any well-stocked grocery store; however, the blend may slightly vary from brand to brand. Watch our video on how to peel and grate ginger! To make the marinade, add yogurt, garlic, ginger, lemon juice, garam masala, salt and pepper to a medium-sized bowl then stir until completely combined. Add diced chicken, stirring until each piece of chicken is coated, then cover and refrigerate for at least 1 hour or overnight. Preheat oven to 475 degrees. Coat a baking sheet generously with cooking spray then spread marinated chicken pieces evenly on the sheet. Bake 10 minutes or until chicken is just barely cooked through and coating becomes scorched in places. Remove from oven then set aside while the sauce is prepared. Place a large high-sided skillet over medium heat then add butter. When butter has melted, add garlic, jalapenos and ginger and cook 1 minute, stirring constantly. Add tomato paste, garam masala and paprika then cook approximately 1 minute to toast spices and brown tomato paste just slightly. Pour in petite diced tomatoes including juice and water. Stir to dissolve then let sauce to come to a boil. Reduce heat to low and simmer 20 minutes, stirring frequently until sauce becomes very thick. If a smooth sauce is desired, you may puree the mixture then return it to the pan. Add cream and chicken, including any juices from the chicken, then stir to combine. Simmer chicken in sauce approximately 10 minutes then season with salt and pepper. Serve over fresh steamed rice and garnish with finely chopped cilantro. Some spice blends and canned tomatoes include salt so don’t add any additional salt to the sauce until after it has reduced and cream has been added.